The next photo shows the door to the cell I was given. Each cell has a text on the door: mine was "Where your treasure is, there will your heart be also". To the right of the door is the hatch where the brothers leave food and any other items such as toiletries, light bulbs etc. that have been requested. Inside is a spacious ambulacrum with windows onto the enclosed garden. 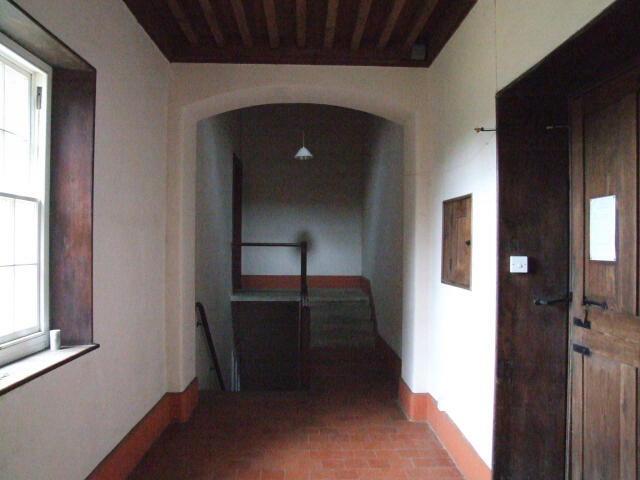 There is thus room for the monk to take exercise if the weather prevents him from walking in the garden. 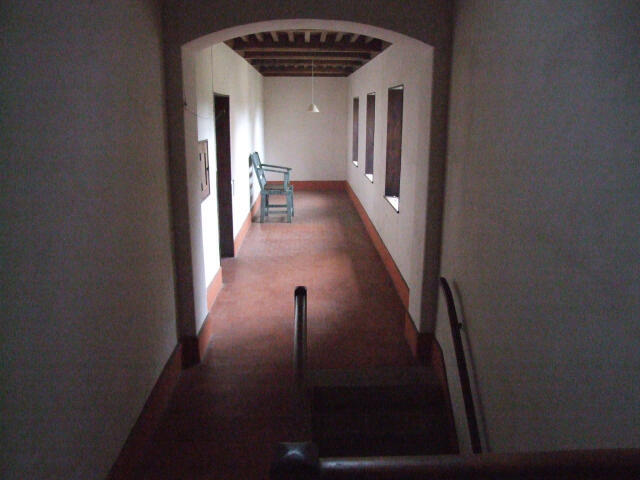 The stairs go up to the main living quarters and down to the work area and garden. To the left of the cell door, you can see the inside door of the hatch. 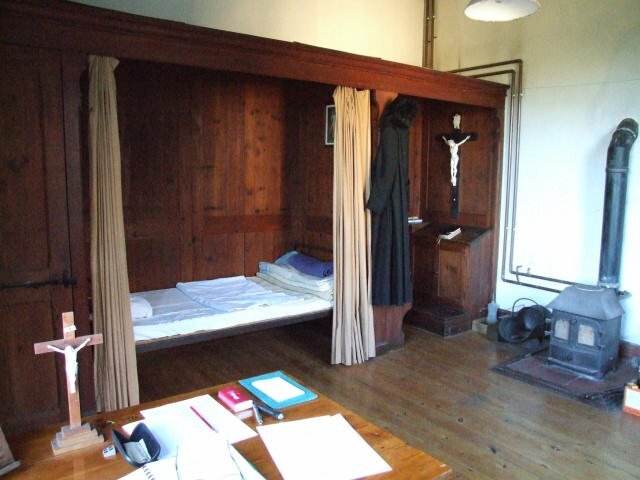 Upstairs, the first room in the main part of the cell is called the Ave Maria. 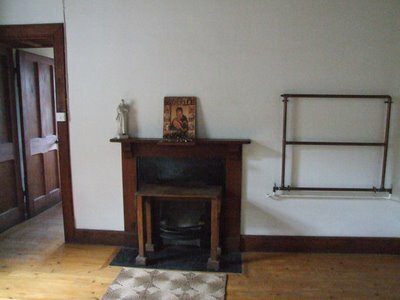 The custom is to kneel down and say a Hail Mary every time you enter this room. The novice master noticed that I knelt on one knee and he gently told me off - "Ah you're like the old Irish fellow - you'd be holding your cap on the other knee and be out the door as soon as the priest said Ite Missa Est." (Fr Cyril is Irish himself.) The Ave Maria is used for light work. Then there is the main part of the cell, the cubiculum. The photo shows the bed and the Oratiorium. The bed is simple - a wooden bed with a thin mattress and a pillow. The pillow gave me another fit of the giggles. Expecting it to be like a modern pillow, I picked it up and moved it. It came down with a thud, being as heavy as a rock and almost as hard. The Oratorium (next to my tell-tale Roman cassock) has a full size choir stall. 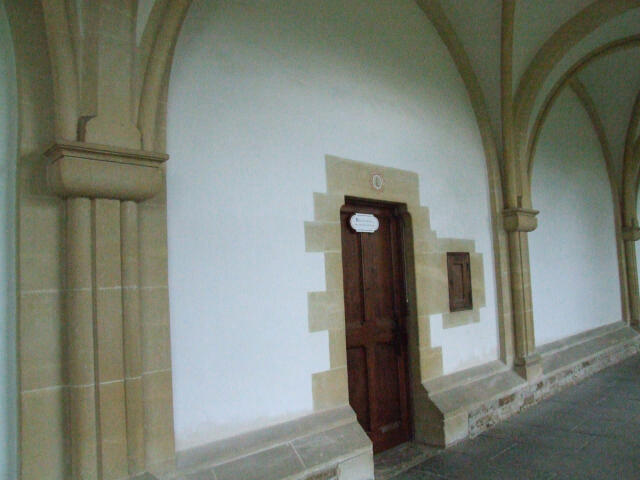 When saying the office privately in cell, the Carthusians observe all the postures that they would observe if they were in Choir. 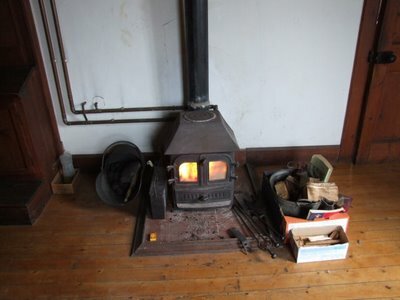 The wood burning stove provides hot water as well as heating. It wasn't really necessary at this time of year but I couldn't resist trying it out. If the fire is packed properly, it roars up very quickly and efficiently. One problem is that the paper used to start the fire was from old copies of the Thompson Directory. It was a bit laborious tearing out pages and screwing them up but I realised that newspapers would be a potential source of distraction. The Carthusian leaves his cell three times a day - for the Night Office, Mass, and Vespers. If it is necessary to leave the cell for something else: to go to the library or to a class, for example, the recommendation is to try to arrange that activity after Mass or before Vespers so that there is no need to leave the cell on an additional occasion. The purpose of the solitude and silence is to draw closely to God in contemplative union - to broaden the inner horizon while restricting the worldly horizon would be one way of trying to explain it. There is a great emphasis on prayer as "direct" union with God - praying rather than thinking about prayer, or God, or the truths of the faith. The Carthusians thus have a strong affinity with the desert Fathers whose aim was essentially the same. 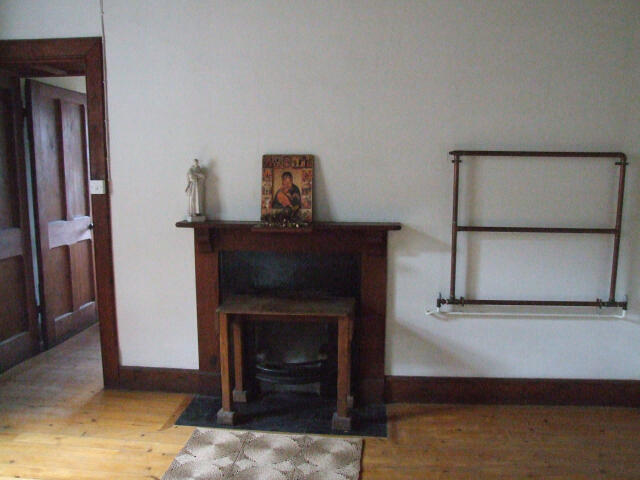 As a parish priest, I am often on my own in the presbytery. People who visit to arrange a Baptism or a Wedding comment on how quiet it is, how they can hear the clock ticking, or the birds singing for example. This is in contrast to a world in which people abhor silence, as "nature abhors a vacuum" and blot out the silence with the television or with recorded music. 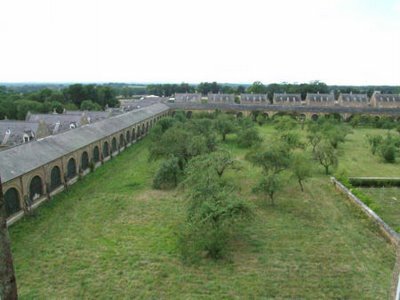 The silence of the Charterhouse is not an empty silence, not simply an absence of noise. It is a silence in which God can communicate with the soul, where distractions are reduced to a minimum. There are, of course, dangers in this way of life. Over nine centuries, a balanced rhythm has developed and matured between silence and prayer in choir; between solitude and recreation (the weekly walk); between stillness and manual work (an essential part of the life); between fasting and proper nourishment. I will explore some of these in future posts.